More and more, I'm finding myself overtaken by an extreme impulse to bake, and it strikes at the strangest times. Most recently, it happened late at night, when Andy was working late and I was caught up on everything I wanted to accomplish for the day. I knew I wanted to make something using white chocolate, since I inadvertently built a stockpile large enough to have us covered if disaster strikes (what, you don't want white chocolate chips when an earthquake hits?!). I decided on muffins. Giant ones. 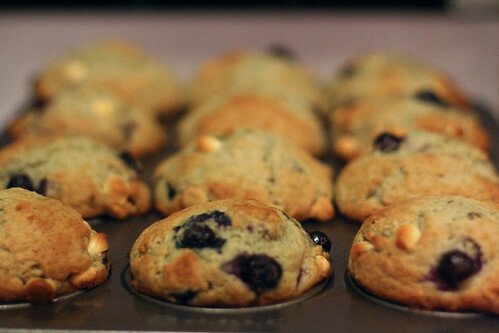 With blueberries and white chocolate chips. I've used this flavor combo before (in bread pudding), and it's a favorite of mine. I didn't have any plain yogurt, so I used blueberry, which explains the strange grayish blue tint and the AWESOME flavor. The texture of these muffins is incredible. Dare I say perfect? I learned some new tricks while making these muffins (yet another reason why America's Test Kitchen is the best thing to happen to my cooking since Bittman). First, don't use muffin papers, just spray the pans to grease them. 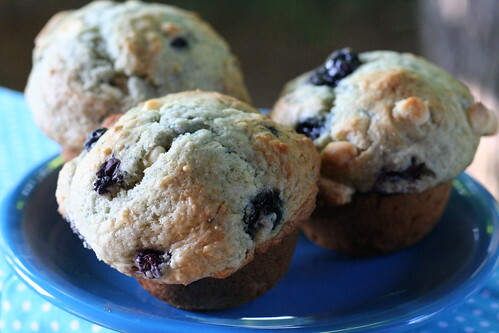 The papers often stick to the muffin and are just not necessary. Another shortcut is to use a greased 1/3 cup measuring cup to divide the batter into the muffin tins. For other recipes I might use a 1/4 cup, (this used a larger one since the muffins were supposed to be big). Finally, if you're baking with blueberries, toss them with a bit of flour before adding them to the batter so they don't all sink to the bottom. 1. Adjust an oven rack to the middle position and heat the oven to 375F. Grease a 12-cup muffin tin. 2. In a large bowl, whisk the flour, sugar, baking powder, baking soda, and salt together. In a medium bowl, whisk the yogurt and eggs together until smooth. Gently fold the yogurt mixture into the flour mixture with a rubber spatula until just combined, then fold in the melted butter and add-ins. 3. Using a greased 1/3 cup measure, portion the batter into each muffin cup. Bake until golden brown and a toothpick inserted into the center of one comes out with just a few crumbs attached, 20-25 minutes, rotating the pan halfway through baking. 4. Let the muffins cool for 5 minutes in the pan, then flip out onto a wire rack, and let cool 10 minutes before serving. You can also toss them with a tablespoon or so of sugar. I usually subtract it from the total amount of sugar called for in the recipe. Same thing if I use flour. I use a red silicone muffin "tray" and love how easy those make it to plop them right out... any thoughts on silicone? @Maggie I've never used silicone, but from what I hear it's a love it or hate it kind of thing. I'm curious to try it sometime! I have a silicone muffin pan too. It must just be me but I have a tendency to tear them. But the muffins don't stick. Great recipe. I'll have to try it sometime. I made these last night-- so good!! I added some pecans and then for extra yum I sprinkled a pinch coarse turbinado sugar on top of each muffin before I put them in the oven. So good!! i love America's Test Kitchen! my absolute favorite cookbooks. They're so informative! I love the domed top! They look really yummy. Does ATK tell you to fold the butter in at the end? Your muffins look perfect! Nice job!